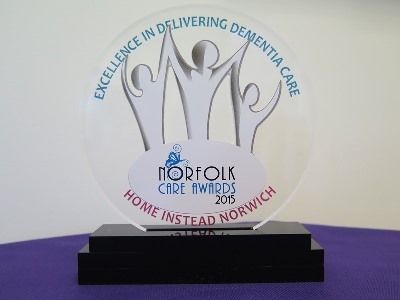 We are delighted to announce that our Norwich office was last night (26th February) named winner of the Excellence in Dementia Care award at the 2015 Norfolk Care Awards. The dementia award was presented to Chris Carter who owns and runs the local Norwich office at a glittering awards ceremony in front of an influential audience including Norman Lamb, Minister of State at the Department of Health; David Prior, chair of the Care Quality Commission (CQC); Andrea Sutcliffe, Chief Inspector of Adult Social Care and Professor Martin Green, CEO of Care England. The award recognises the implementation of new and innovative thinking to improve the quality of dementia care. The judges were also looking for a service where all those involved understand the needs of people with dementia and where there is a focus on relationship centred care. Congratulating Chris and his team on the win, Trevor Brocklebank, CEO of Home Instead said, “Chris and his team at Home Instead in Norwich are doing great work to support people living with Alzheimer’s disease or another dementia. “As well as providing quality dementia care, the team is heavily involved in local dementia initiatives and this will certainly have impressed the judges. “Chris has helped to set up and run a monthly carers group in conjunction with Norfolk and Suffolk NHS Foundation Trust and Norfolk Carers Support. They are also active in sharing their knowledge of caring and supporting people with dementia with the wider community and run free monthly workshops for family carers and professionals.